Nothing beats a beautiful day of Atlanta weather, except for maybe having a great screened-in outdoor space to enjoy it. Though wonderful for its practical purposes, your screened enclosure should be much more than a way to create shade and keep bugs at bay. What about those times you want to entertain? Turning your screen enclosure into a fabulous dining area doesn’t have to be a difficult (or super expensive) task. Whether you’re looking to build a new screened enclosure, or you have one already in place, here’s a look at some great dining decorating ideas for the screened in patio or porch in your Atlanta home. If you love the rustic old cottage charm, consider decorating your screened enclosure with rustic and worn pieces. Take a trip to some yard sales or antique stores in and around the Atlanta area, and mix and match a bit to give your outdoor dining space a unique feel. Try pairing a farm table with some patinaed chairs. Take a weathered buffet & turn the top into a flowerbed. Add some additional rustic touches like old watering cans or milk jars. Add an old-fashioned tablecloth to compliment the look. You don’t have to spend a lot of money to give your screened in patio or porch a great rustic look. A little creative thinking goes a long way. More of the modern type? Love the classic, clean lines of the modern look, but still want something a little more casual for your screened-in patio or porch? Then simple geometric shapes are the way to go. 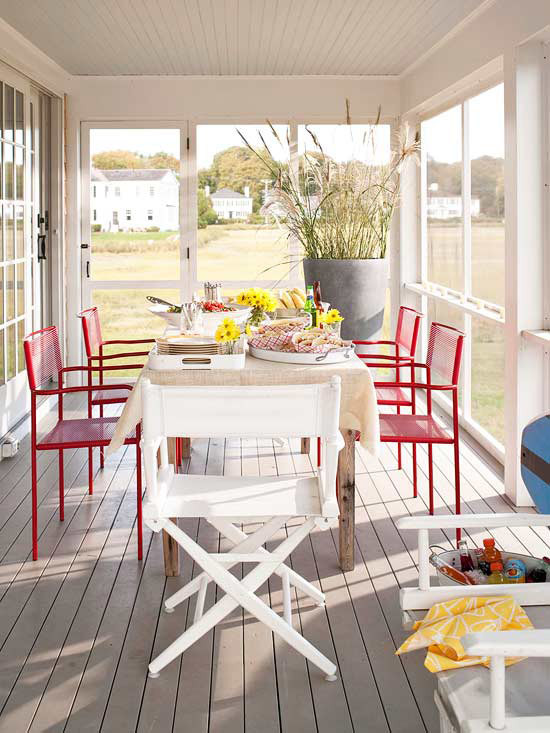 Combine brightly colored metal chairs with canvas director chairs to create a casual, yet modern feel in your screened enclosure. A clean linen table cloth adds a beachy appeal, while a large urn adds to the modern flair. Grey floors help to further define the space. Need an outdoor space that works well for the kids too? If you need your screened in patio or porch to serve as an entertaining area for your kids as well, but you don’t want to compromise on style or sophistication, then consider adding some chalk paint to your outdoor table. The kids will love having a creative space to draw and you’ll love having an easy table to clean. Add a few extra touches and you’ll still have a stylish outdoor area for your own adult entertaining too. Here again you can hit up yard sales or antique stores around the Atlanta area to find a table. A table with corbeled legs will add a touch of elegance, and colors like charcoal grey, white and brown will keep the area inside your screened enclosure feeling stylish and sophisticated. Add a wiry chandelier and an old window pane to give it a vintage look. Decorating your screened enclosure to make it a great area for dining and entertaining will make it that much more of an enjoyable place for you and your family. If you’re in the market for a custom built screen enclosure, sunroom or pool enclosure in and around the Atlanta area, contact the experienced professionals at DC Enclosures to schedule your complementary in-home consultation. Get on your way to a beautiful screened in patio or porch today!